The Forum of Cultural Cooperation Solingen-Minsk has been arranging musical series since 1997. This year, as in other years, renowned musicians have been found to give benefit concerts for the forum to enable them to host the 'Robert-Schumann-Tage des Bergischen Landes' in the fall. The initial concert of this series was performed by the internationally respected duo of Detlef Tewes and Boris Björn Bagger. They have been playing to enthusiastic, culturally diverse audiences throughout Europe in this combination since 1988. This was also the case in the full Klingenmünster concert hall. One can have no idea of the intense impressions an unobtrusive instrument such as the mandolin can make, especially when being played by one of the world's best mandolinists and accompanied so harmoniously by one of the best concert guitarists in the world unless one has heard them before. It was hard to name obvious highlights of the first-class program, from the furious beginning with variations of the traditional Greensleeves' to the irrestible 'Capriccio Spagunolo' by Carlo Munier. Many find the pieces by the 'Devil's violinist' Nicolo Paganini unsurpassable in the interpretation of Tewes and Bagger, others are charmed by the piece 'Histoire du Tango', originally written for flute and guitar by Astor Piazzola. In 'Three Episodes' by Otto Freudenthal, written for Tewes, he displayed his virtuosity as a soloist, as did Bagger with 'Prelude I' by Heitor Villa-Lobos. It was the composition 'For B.B.B. and his Friend' by the late Lepo Sumera, who in Estonia belongs to the greatest symphonic composers, that left the deepest impression. "This concert with the virtuosos Detlef Tewes and Boris Björn Bagger has been this seasons main event!" "Phantastical start for the concerts in Aulendorf Castle - the glamorous hall was sould out". "The Capriccio Spagnuolo proved to be another irresistably catchy piece receiving thunderous applause." "He, who does not know Detlef Tewes can not believe the wondrous things he can create with his inconspicuous looking mandolin"
"Detlef Tewes wandered between gracefully romantic passages and diabolicaly pacefull parts, a true musical firework for Mandolinists." 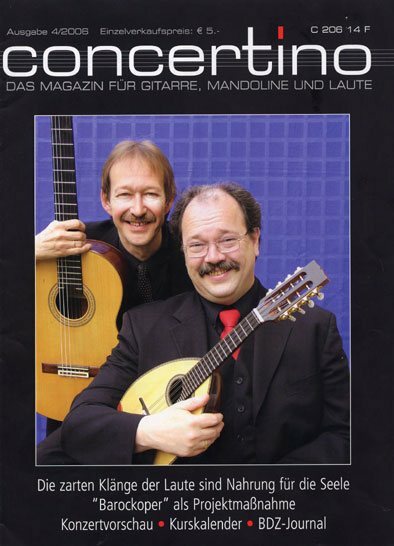 "Detlef Tewes is; the greatest living Mandolinist, he mastered quick jumps, arpeggios, scales and chords with absolute confidence and musical wit." " .... Boris Björn Bagger proved, his reputation to be one of Germany's best guitarist is justified........"
The "devilish violinist" Niccolò Paganini played mandolin and guitar. The fame that immortalized Vittorio Monti came from a single piece, his "Czardas". Hardly anyone knows though, that it was originally composed for mandolin. The Violin concert by Felix Mendelssohn-Bartholdy has often been played in chamber concerts, with the composer playing the piano and the mandolinist Vimercati, who played the violin-part on the mandolin. Many musical pieces have been dedicated to the duo Tewes - Bagger , among which some by Lepo Sumera, Dietrich Erdmann, Raimo Kangro, Urmas Sisask, Wolfgang Riehm, Erkki-Sven Tüür and Valdo Preema.